The KL Sentral development on the right is progressing smoothly. (Bottom pic) The old KL Central Market. The redevelopment and regeneration of huge swathes of Kuala Lumpur and other parts of the Klang Valley is taking on a fresh fervour with new residential and commercial projects set to juxtapose with the existing city skyline and landscape. The upcoming regeneration projects that will change the skyline and landscape of the Klang Valley include that of the new Kuala Lumpur International Financial District (KLIFD) at the old government quarters at Jalan Tun Razak; Bandar Malaysia at the former Royal Malaysia Air Force site in Sungai Besi; Warisan Merdeka in Stadium Merdeka and Stadium Negara; and the redevelopment of Pudu Jail. 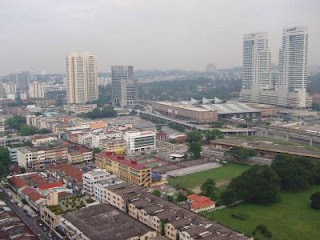 There are also the planned redevelopment of the Pekeliling Flats at Jalan Tun Razak and the former Wisma Angkasa Raya building in Jalan Ampang. In the Klang Valley, the development of the 3,300 acres of the Rubber Research Institute land in Sungei Buloh has also hyped up much interest among industry players. According to Mah Sing Group Bhd group managing director and chief executive officer Tan Sri Leong Hoy Kum, the scarcity of prime land in good locations as well as rising cost of good land and properties have made it more commercially viable to redevelop land. “These kind of land generally serves an established demographic, and the projects will be able to attract a ready target market,” he says. Leong says redevelopment is a good way to effectively utilise prime landbanks, unlock land value, and pursue new projects that cater to current market needs. These projects will hopefully raise Kuala Lumpur's liveability index and catapult it to join the ranks of the other global cities. Leong points out that the Kuala Lumpur Central Market is a good example of a redeveloped project as it holds historical importance and architectural significance due to its strong art deco design language, and its ability to be re-purposed to modern needs. “Back in 1888, it used to be an open wet market and by the 1930's a permanent structure was put up. Towards the end of 1970s, the Malaysian Heritage Society decided to preserve the building under its heritage programme. It is now a tourist attraction and a one stop shopping centre for local products such as handicraft, art, kebaya, songket, batik and a wide variety of Malaysian cuisines,” Leong says. Property consultancy CB Richard Ellis executive director Paul Khong says redevelopment projects will bring back vibrancy to the city and if done right, this renewal factor will continue to enhance property values. “A good and new major redevelopment project like the KLCC can turn around the entire locality into a popular neighbourhood, change the focus of the super prime locations in the city, increase capital values and demand, and change the real estate value patterns of the entire neighbourhood,” Khong points out. “It is necessary to adopt a well planned approach in the redevelopment process and proper town planning must be done with the relevant authorities taking into account or anticipate the problems which are also associated with such redevelopment projects. “I think we need a mechanism like Singapore's where a general consensus from about 80% of the unit owners are required to allow for a redevelopment of their own residential project. A strong legislation on this aspect will be welcomed,” Khong adds. VPC Alliance (KL) Sdn Bhd managing director James Wong concurs with Khong. “Hence, all these redevelopment projects have to be phased to take into consideration the supply and demand in the property market. Otherwise, the planned projects will generate millions of square feet of residential towers, hotels, office blocks and shopping malls. “Based on the moderate economic growth of about 5% for the next three years and with Malaysia recording a net negative outflow of investments to the tune of RM48.9bil from 2009 to 2011, there will be not enough effective demand to absorb the millions of square feet of these upcoming developments,” Wong cautions. He says DBKL as the planning authority has a role to play to regulate the supply by providing planning approvals on a staggered basis instead of giving blanket approvals. And the banks also have a role to play by insisting on market and financial feasibility studies to ensure the viability of a project prior to granting bank loan approval. “The Greater Kuala Lumpur covers an area of 2,793.27 sq km and is administered by 10 municipalities surrounding Kuala Lumpur. Each local authority and municipality currently acts independently on planning approvals without referring to the planning approvals of the other neighbouring municipalities. Amongst the 10 municipalities, there should be a coordinating committee to oversee the planning application and planning approval of large development projects. “The coordinating committee should carry out studies on the impact of these projects to the property market and the environment. This is to enable developers to have greater awareness of the incoming supply and they will be able to better plan and phase out their developments. Such a measure will help to minimise another crisis similar to the Asian financial crisis of 1998 where many commercial buildings and large projects in Kuala Lumpur failed and were abandoned,” Wong explains. To avoid such a potential situation, Wong echoes Khong's calls for the local authorities to emulate the planning model of Singapore's Urban Redevelopment Authority (URA). “Singapore's URA's planning is so systematic. They will ensure all properties are developed and used according to the master plan for each individual lot parcel. The URA will only release land parcel for sale for redevelopment purposes if there is effective demand in that particular location, and for each land parcel, there are clear cut planning guidelines of the number of storeys, type of uses, density, and the number of car parks a developer can built,” Wong says. DTZ Nawawi Tie Leung executive director Brian Koh says given the escalating land cost and the need to better utilise scare land resources, there is a lot of potential to redevelop the older properties in the capital city. “These projects will bring back life, commercial activities and value to blighted areas within the city centre, and create an anchor for the revitalisation of the entire area. “The potential impact to the property's value and the overall property landscape will be significant over the long run. An anchor project will help to trigger off the forces, so it will help if we have a financially strong consortium to manage such projects, especially if it involves a big area that need acquiring and putting capital into,” Koh says. Koh also points out the need to take into account conservation issues for the older parts of the city where there are cultural or architectural heritages. VPC Alliance's James Wong concurs with Koh on the need to preserve and restore heritage and historical buildings. “Many old buildings in KL's city centre are of neo classical and the art deco design, and such buildings should be preserved and restored,” Wong says. Wong says the government has appointed organisations such as Malaysia Heritage Trust, DBKL's Conservation and Townscape Unit, and the Museum and Antiquity Department of the National Museum to implement, monitor and supervise conservation activities of old buildings.